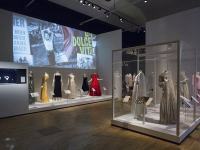 A new exhibition – The Glamour of Italian Fashion, 1945-2014 – recently opened at the Victoria & Albert Museum in London. 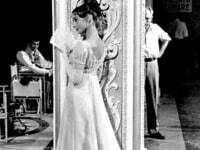 I went to see it this week and really enjoyed it. It was beautifully and clearly laid out and I learned a lot about a subject more or less new to me. I was interested (of course) in two intriguing links to Russia. Claiming Russian royal lineage, Princess Irene Galitzine was born in Tbilisi, Georgia in 1916. Her parents fled their home after the 1917 Russian Revolution and settled in Italy. Irene Galitzine worked as a designer in Rome, setting up her own salon there in 1946. 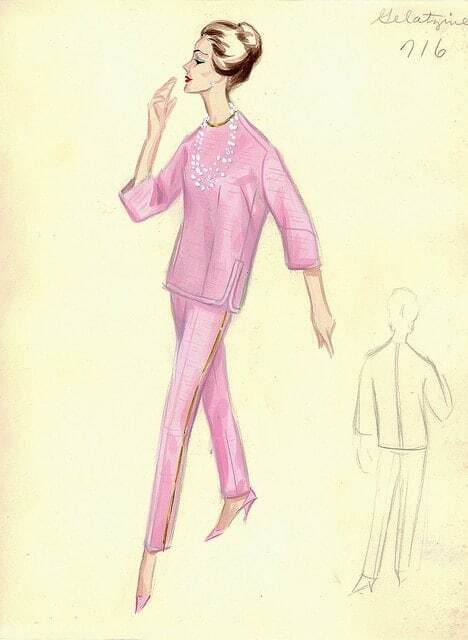 She is credited with creating the ‘palazzo pyjama‘ ensemble, in 1960. This style of tapered trousers and boxy tunic became a chic choice for less formal evening wear. 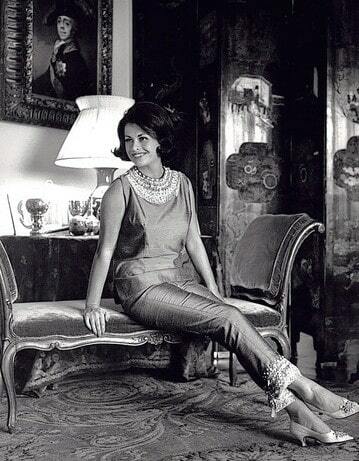 Jackie Kennedy and many other fashionable women wore Galitzine’s palazzo pyjamas for informal entertaining. 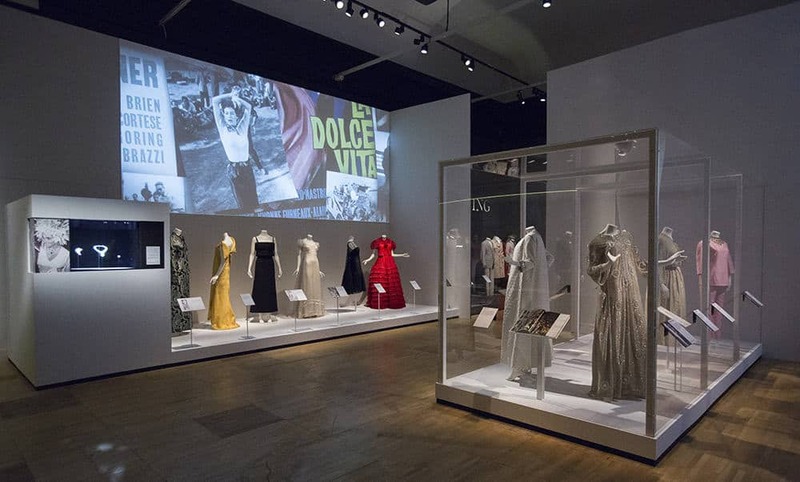 The exhibition drew attention to the phenomenon of ‘Hollywood on the Tiber’. 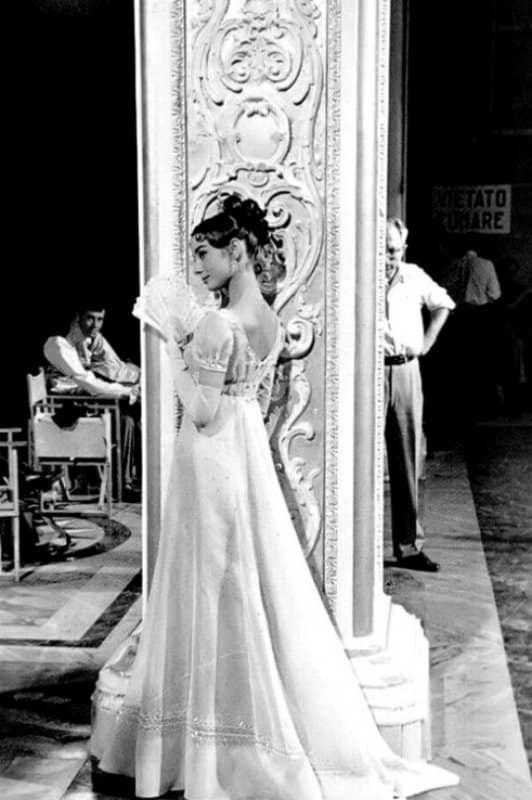 During the 1950s and ’60s many Hollywood films were shot on location in Italy, making use of the established film studios there – notably Cinecittà and the Ponti-De Laurentiis studios in the Rome area. 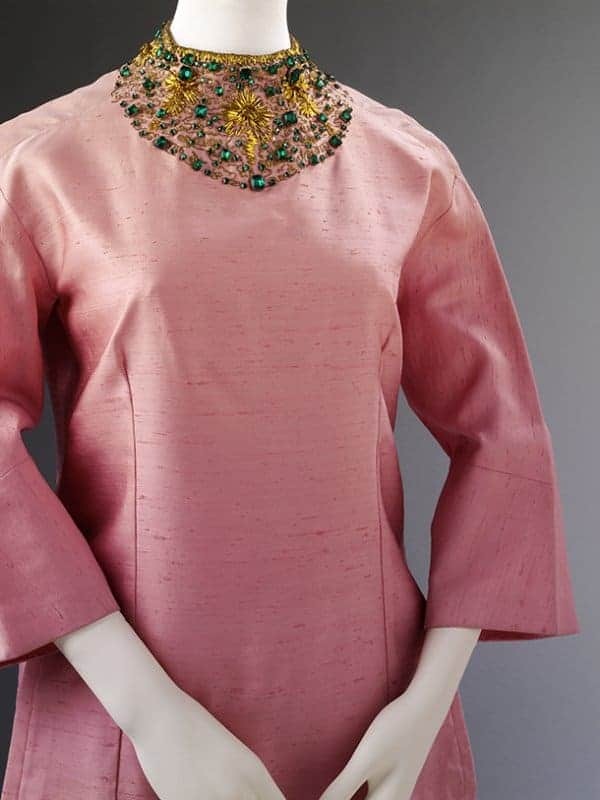 Many of the stars were dressed, on and off the set, by Italian designers – and this had an enormous impact on fashion as stars such as Elizabeth Taylor and Ava Gardner became style ambassadors for Italian fashion, fuelling a keen international appetite for luxurious clothing made in Italy. 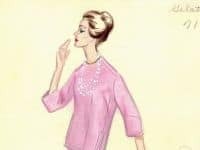 The designer Fernanda Gattinoni’s clientele included numerous actresses – among them Ingrid Bergman, Lana Turner and Audrey Hepburn. 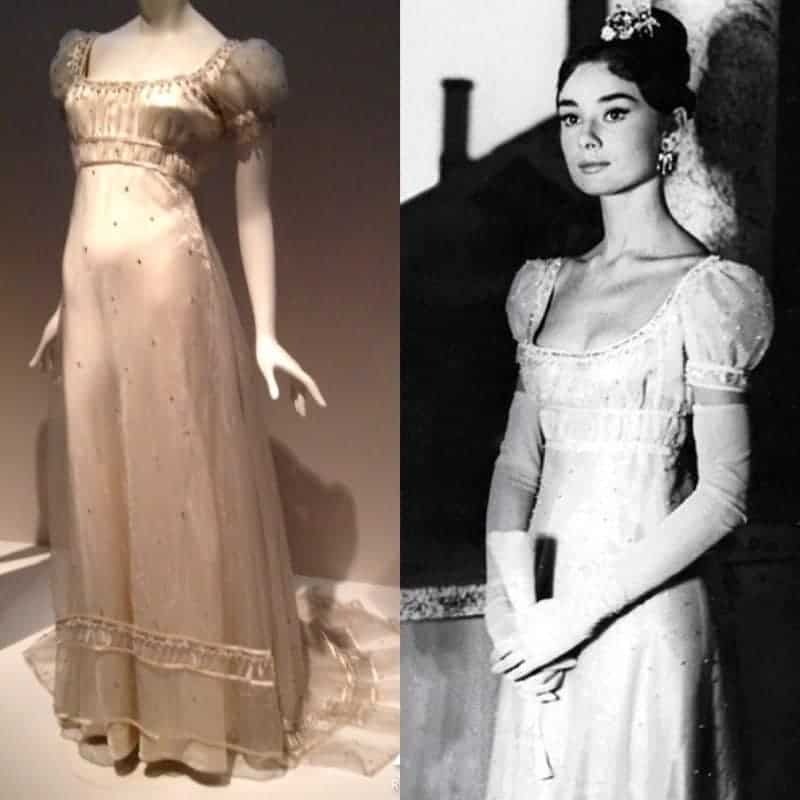 In 1955 she designed several of Hepburn’s costumes for the film of Tolstoy’s ‘War and Peace’, including the delicate evening gown shown in the exhibition. 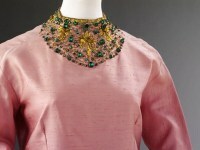 She subsequently designed a contemporary fashion collection based on this dress’s high-waisted Empire-line. 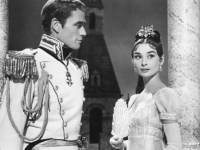 Gattinoni was nominated for an Oscar for her work on ‘War and Peace’. I was surprised to find out that it was filmed entirely in Italy, either on location or in the studios.